Google Analytics offers insights into webpage visitors, which can give you a greater understanding of your customers, and how to improve your business. Bookwhen makes it simple to integrate Google Analytics with your online booking system. Log in in to your Google Analytics account. Click Tracking Info - Tracking Code. You can find your tracking ID at the top of the page (it will look something like this: UA-1234567-8). Make a note, or copy of this code. 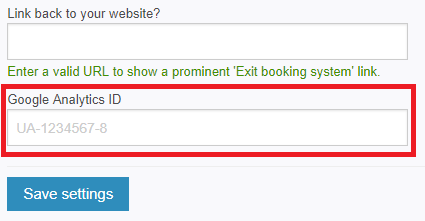 Log in to your Bookwhen account as an administrator and then navigate to your Public page. Click on page setup then find the Google Analytics ID field and enter your tracking ID. Click to save settings. Your Bookwhen account is now linked to Google Analytics and you should see data from your page visitors begin to appear in your Analytics dashboard within 24 hours.